That’s what a team of physicists has done – they created an experiment that spits out atoms through the same process by which atoms normally emit light, called “spontaneous emission.” As weird as that may sound, they’re interested in an even more elusive phenomenon: the strange behaviour of a matter called photonic crystals. “It’s a novel system that’s a rich playground,” study author Dominik Schneble from Stony Brook University told Gizmodo. Schneble felt it would be a useful tool to study systems that generate light – like photonic crystals. Photonic crystals are forms matter through which some frequencies (essentially colours) of light can’t travel. These are substances that exist in nature in the form of some animals’ colour patterns, and have lots of uses in creating high-tech optical equipment. Light takes on wacky properties when confined to these photonic crystals. They may experience “fractional decay,” where the system has somehow both emitted and not emitted its light at the same time – basically, the atom is in an excited quantum state of excited and not excited. And usually, atoms spit out their light pretty quickly after they’ve been excited. But in photonic crystals, these atoms might remain excited without spitting out their light for a long time, study author Ludwig Krinner from Stony Brook told Gizmodo. 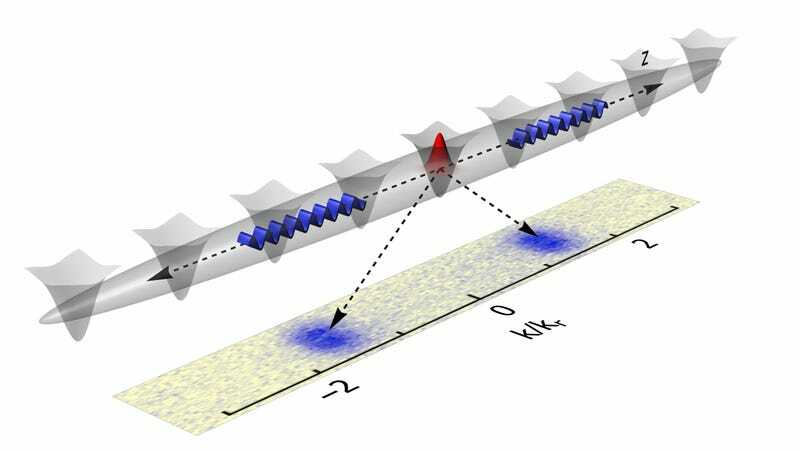 The new system looked the way many Bose-Einstein condensate experiments look, with lasers trapping rubidium atoms. The interaction of the lasers created a straight line of potential energy wells – picture a single row of an egg carton. They filled the wells with cold rubidium atoms that could be in one of two states, which they called “red” and “blue.” “Red” rubidium atoms stuck within the walls of the energy wells. But “blue” ones would ignore the walls completely, and moved freely out of the laser-imposed boundaries. Adding an oscillating magnetic field allowed the atoms to switch between these two states.